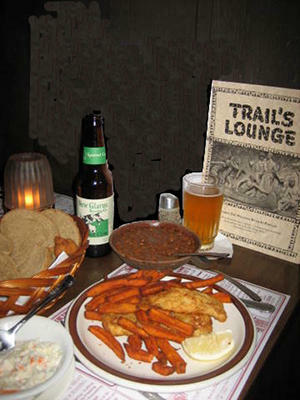 Wisconsinites love their fish fry and there is nothing better than the Friday night fish fry at the Trail’s where you can sample Manoucher’s beer batter recipe, a well guarded house secret. It’s not only the great food that makes a real Wisconsin Friday fish fry, it’s the atmosphere, the kind of community togetherness inspired by the venue and the crowd. Come on down and see for yourself! All dinners above include: Choice of potato, cole slaw, baked beans, rye bread & butter and complimentary corn fritters with honey butter. Extra piece of cod available with 3 Piece cod for $1.50.